Embellish your walls with our posters in gold and silver. Our trendy gold and silver wall posters match elegantly with brass and marble interior elements. Add a golden touch to your life with glittering art – combine with one of our metal frames in gold and silver for extra bling! Explore our posters and prints in gold and silver. We have diverse art designs in the form of text posters and graphic design prints in gold, silver, and copper that will effortlessly add luxury to your home. We have everything from gleaming and garish gold and silver posters to those with subtle, glimmering details. 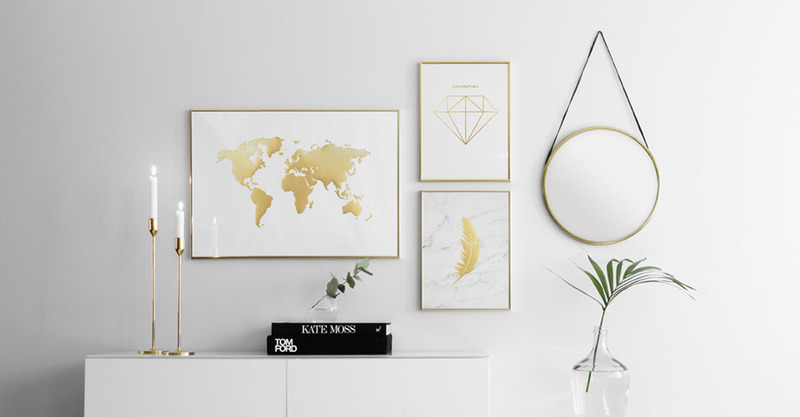 Create a glittering gallery wall with posters in gold and silver only, or add a design or two for a stylish, metallic effect. And for the perfect ensemble, match the posters with our diverse metal frames! Our gold posters are printed with high-quality gold foil that makes the design shine for a genuine metallic look. The majority of our posters are printed with high-quality foil which gives them a very exclusive feel. But you’ll also find posters without the gold foil that are printed using our regular offset technique. It can be clearly read in the product description whether the poster contains gold foil or common gold screen print. Explore our Gold and Silver inspiration room to find out how we match our silver and gold posters in complete gallery walls!